MicroRNAs are epigenetic regulators of gene expression at the posttranscriptional level. They are involved in intercellular communication and crosstalk between different organs. As key regulators of homeostasis, their dysregulation underlies several morbidities including kidney disease. Moreover, their remarkable stability in plasma and urine makes them attractive biomarkers. Beyond biomarker studies, clinical microRNA research in nephrology in recent decades has focused on the discovery of specific microRNA signatures and the identification of novel targets for therapy and/or disease prevention. However, much of this research has produced equivocal results and there is a need for standardization and confirmation in prospective trials. This review aims to provide an overview of general concepts and available clinical evidence in both the pathophysiology and biomarker fields for the role of microRNA in AKI and kidney transplantation. MicroRNAs (miRs), an evolutionary conserved class of noncoding RNAs, are negative regulators of post-transcriptional gene expression. Sequence-specific binding to the target mRNA results in translational inhibition or mRNA degradation. MicroRNA dysregulation is involved in the development and progression of numerous diseases, including cancer, cardiovascular and kidney disease. MicroRNA synthesis takes place through a canonical pathway involving four key enzymes or, alternatively, via the mirtron pathway (Figure 1). Genomic events or inhibition of regulatory enzymes all can lead to microRNA dysregulation in disease. MicroRNAs execute not only their repressive function intracellularly, but are also released into the extracellular compartment where they act as hormones and/or biomarkers (Figure 1). 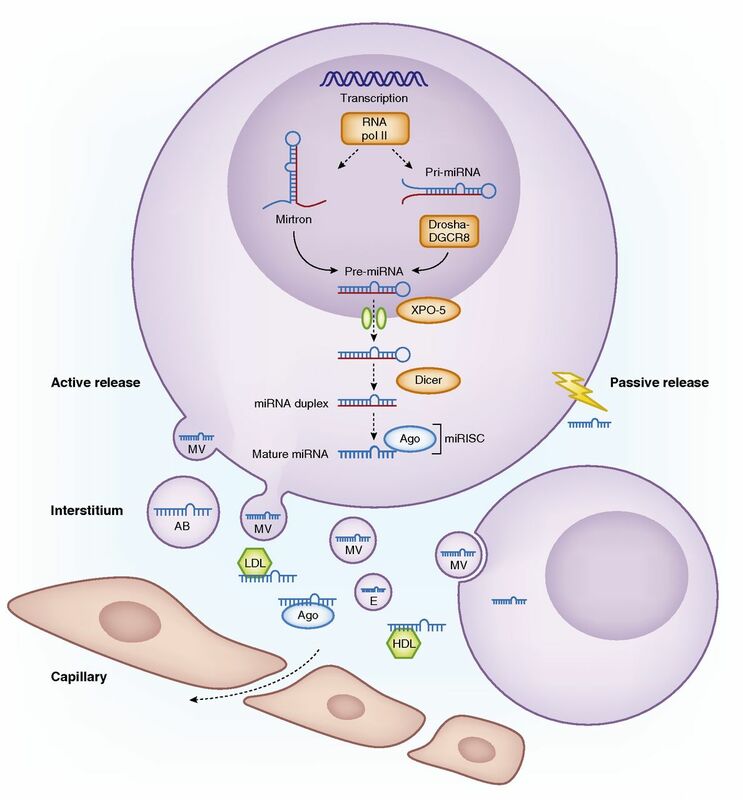 Apart from being released passively as a result of cell death or injury, microRNAs are actively secreted in different types of extracellular vesicles, including exosomes, microvesicles, and apoptotic bodies. Circulating microRNAs form complexes with RNA binding proteins including Argonaute (AGO) 2 proteins and lipoproteins, which protects them from RNAse-dependent degradation (1). Interestingly, microRNAs are both important paracrine and endocrine intercellular communicators (2,3) (e.g., muscle–kidney crosstalk (4)). After uptake, specific microRNA can exert their silencing function in the recipient cells. In vivo modulation (merely inhibition) of microRNA expression as a therapeutic strategy is widely explored and in CKD, several microRNA-targeting drugs have entered clinical testing (5). In autosomal dominant polycystic kidney disease, insight in the pathogenetic role of miR-17 (6,7) recently lead to the start of a phase 1 trial of an anti–miR-17 compound (RGLS4326). Likewise, miR-21 inhibition in Alport syndrome shows promising results, both in an animal model and in vitro studies (8), and a phase 1 clinical trial is currently ongoing with an anti-miR compound (RG-012). In contrast, trials targeting microRNAs in the field of AKI or kidney transplantation have not entered the clinical phase yet. This review provides an overview of the clinical evidence of both the pathogenic role and the diagnostic potential of miRs in AKI and kidney transplantation. A comprehensive review on the role of microRNA in CKD has recently been published (9). Tables 1 and 2 show the current evidence for AKI and transplantation-related disorders, respectively. Several caveats apply when interpreting the study results. First, the considerable heterogeneity in the techniques used (quantitative RT-PCR, microarrays, next generation sequencing) (10) and patient groups studied makes intergroup comparisons and independent validation difficult. Second, several of these studies investigated microRNA target prediction and mRNA interactions through biostatistical modeling. However, experimental validation remains important. Third, natural interindividual variation in microRNA expression levels is not well defined (11,12). Technological developments, principally the use of single-cell sequencing technologies, could add in-depth analysis to this area and enable a more comprehensive picture. From limited human experiments, microRNAs appear to act via different mechanisms. Some microRNAs repress pathways that play a protective role in kidney physiology, whereas a proinflammatory effect by inhibition of anti-inflammatory pathways or mitochondrial function have also been described. Several microRNAs appear to play a role in AKI, where the release of multiple IL precedes structural kidney damage (Figure 2). 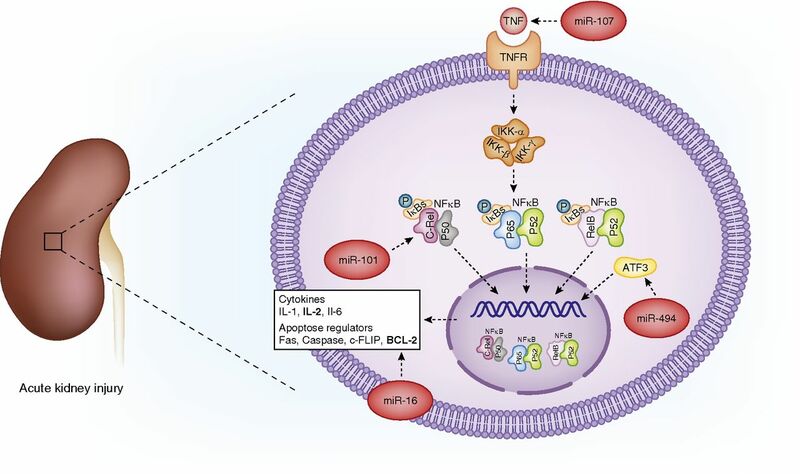 These include miR-101 (IL2, NFκB pathway) (13), miR-494 (activating transcription factor 3 in NFκB pathway) (14), miR-16 (BCL-2) (15), and miR-107 (TNF) (16). Interestingly, urinary miR-494 levels, as opposed to serum levels, increase early in critically ill patients with AKI. In turn, miR-494 inhibits the expression of the kidney protective gene ATF3, resulting in aggravated kidney injury (14). C/EBP-β (C/enhancer binding protein-β) upregulated miR-16, which in turn blocked one of the antiapoptotic genes, BCL-2, after ischemia/reperfusion-induced injury (15). In septic patients with AKI, increased miR-107 induced TNF secretion by targeting DUSP7 (dual specificity protein phosphatase 7) in endothelial cells, which may directly cause tubular injury (16). In vitro inhibition of this microRNA resulted in attenuated TNF secretion and prevented subsequent tubular cell injury (16). In a study by Ge et al. (17), 37 microRNAs were differentially expressed in the serum of patients with sepsis-induced AKI versus those with non-sepsis AKI. Eight of them were associated with 13 genes involved in mitochondrial oxidative stress and dysfunction response, including peroxisome proliferator-activated receptor γ coactivator 1-α, sirtuin 1, mammalian target of rapamycin, oxidative stress responsive 1, and NADPH oxidase 5 (17). Congruent with these observations, upregulation of kidney tubular miR-709 after cisplatin-induced AKI hampers mitochondrial function and induces cell apoptosis (18). Ischemia/Reperfusion Injury and Delayed Graft Function. A schematic overview of the pathogenic role of different microRNAs in transplantation-related kidney disease is given in Figure 3. MicroRNAs are involved in the regulation of angiogenesis and apoptosis through TGF-β, endothelin, vascular endothelial growth factor, and PDGF signaling (19). Upregulation of miR-182–5p, miR-21–3p, and miR-146a have been reported (20,21). The overexpression of miR-146a probably represents a compensatory mechanism because in vitro experiments identified the role of miR-146a as a negative regulator of inflammation in tubular cells by downregulation of the NFκB/C-X-C motive chemokine ligand 8 pathway (21). 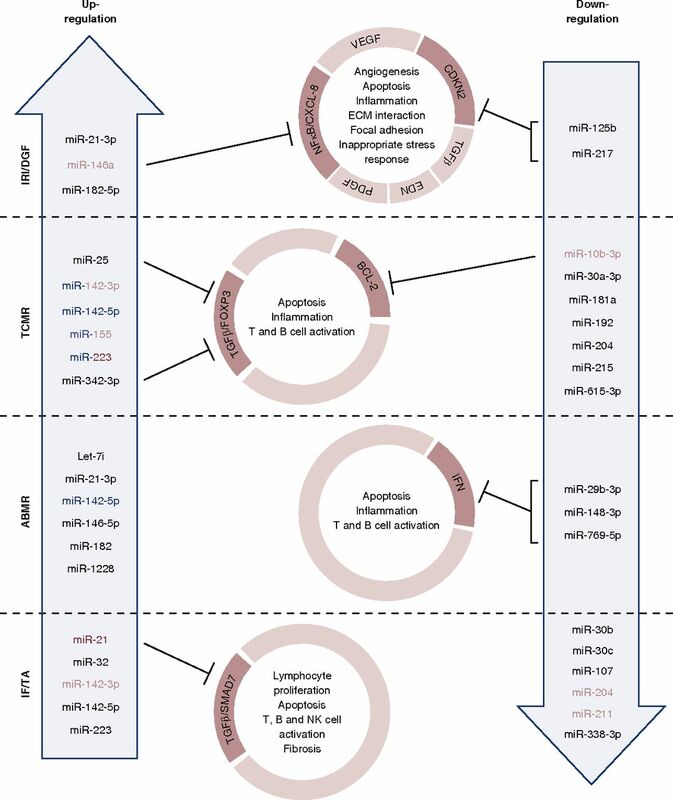 In multivariable logistic regression analysis, the expression of miR-217 and miR-125b (both targeting cyclin-dependent kinase inhibitor 2 loci) in preimplantation biopsy samples together with donor age and type were independently associated with delayed graft function, which could be predicted in 84% of cases (22). Recently, delayed graft function was identified as a manifestation of allostatic overload at a transcriptional level (23). A composite indicator of accumulated biologic stress over the life course is defined as allostatic load, which predisposes to morbidity in case of chronic or repeated stress exposure. Organs undergoing delayed graft function exhibited a greater magnitude of change in transcriptional amplitude and elevated expression of noncoding RNAs and pseudogenes, consistent with increased allostatic load than in those showing immediate graft function. Notably, this study incorporated a validation biopsy set and individual validation of targets transcriptionally and post-transcriptionally. Additionally, it undertook a crosscomparison with publicly available data sets for kidney pathologies, used to identify significant transcriptional commonality for over 20 delayed graft function transcripts providing a clear molecular signature for the burden of “wear and tear” within the kidney and age-related physiologic capability and resilience. The expression of the CDKN2 locus transcripts in this cohort related to the delayed graft function outcome and perfusion status at the transcript level. These results indicate that CDKN2A/p16INK4, ARF/p14, and CDKN2B reflected the allostatic load (and biologic age) of these organs preperfusion. Regulation of these loci by miR-125b is a notable feature. Global miR expression profiling of grafts with T cell–mediated rejection showed that miR-142–5p, miR-155, and miR-223 each predict T cell–mediated rejection with high sensitivity and specificity (area under the curve, 0.96–0.99) (24). Their correlation with intragraft CD3 and CD20 mRNA levels suggests that these miRs originate from immune cells infiltrated in the graft (24). Other groups have shown similar patterns for miR-142–5p (25), miR-155 (19,25,26), and miR-223 (25–27). In addition, miR-10b (antiapoptotic targeting BCL211 (26)) and miR-30a-3p appeared to be downregulated in rejecting graft tissue, as well as correlating with kidney tubule–specific mRNAs (Na+-K+-2Cl− cotransporter) (24). In a small set of biopsy specimens, eight miRs were upregulated and 12 miRs were downregulated in T cell–mediated rejection (28). Vitalone et al. (29) identified 19 microRNAs that may target the differentially expressed mRNAs in T cell–mediated rejection. Validation of these microRNAs revealed significant upregulation of three miRs (Table 1) and downregulation of six miRs in rejecting versus nonrejecting grafts. All upregulated miRs were associated with tubulitis and interstitial inflammation, suggesting infiltrating lymphocytes as the origin of these miRs, whereas miR-204, miR-210, and miR-10b-3p negatively correlated with Banff scores. The TGF-β signaling pathway, and in particular forkhead box P3 regulated transcription, is common to the regulatory action of all these miRs (29). Oghumu et al. (27) have identified a panel of 25 miRs significantly differently expressed in grafts from recipients with acute rejection compared with acute pyelonephritis. Interestingly, some previously reported downregulated miRs in T cell–mediated rejection grafts, including miR-23–3p (19), miR-30a-5p (24), miR-30d-5p (24), miR-30c-5p (24,26), and miR-99b-5p (19), were significantly upregulated in acute pyelonephritis compared with rejection biopsy specimens (27). Upregulation of miR-146–5p, miR-182, miR-21–3p, miR-1228, and let-7i, involved in inflammation, chemokine and cytokine signaling, apoptosis, and IL signaling, has been observed in grafts with antibody-mediated rejection (19). Increased miR-142–5p expression levels were observed in PBMC and grafts from recipients with chronic antibody-mediated rejection compared with normal allografts and PBMC from stable kidney transplant recipients. miR-142–5p overexpression was associated with downregulation of 41 genes related to a cell-mediated immune response (30). Of note, miR-146–5p as well as miR-142–5p were also significantly upregulated in grafts with T cell–mediated rejection (24,25). To unravel the molecular mechanisms underlying chronic antibody-mediated rejection, Rascio et al. (31) performed a combined mRNA and miR expression analysis in PBMC from kidney transplant recipients with chronic antibody-mediated rejection and normal allografts. Four miRs were found to be modulators of six mRNAs involved in the type I IFN signaling network. miR validation in an independent set of PBMC revealed a significant downregulation of miR-148b-3p, miR-29b-3p, and miR-769–5p. No overlapping miR signature could be identified with the data from Danger et al. (30), possibly because of methodological differences and definition of the controls. Interstitial Fibrosis and Tubular Atrophy. Fifteen miRs have been identified as being of interest in interstitial fibrosis and tubular atrophy (IF/TA), relating to regulation of lymphocyte proliferation and B, T, and natural killer cell activation/differentiation. The expression of five of these miRs has been independently validated, with miR-142–3p (32,33) and miR-32 being upregulated and miR-204, miR-107, and miR-211 (33) being downregulated in grafts with IF/TA (34). The upregulation of miR-142–5p, miR-21 (35) (target: SMAD7, an inhibitor of TGFβ-mediated fibrosis), and miR-223, and downregulation of miR-30b, miR-30c, and miR-338–3p were confirmed in an independent but small set of IF/TA biopsy specimens (36). Similar miR expression data for miR-142–3p (24,25,27,29), miR-142–5p (24,25), miR-223 (24–26), miR-204 (24,27,29), miR-30c (24,26,27), and miR-30b (24) was found in intragraft miR profiling studies on rejecting allografts, particularly T cell–mediated rejection. Because microRNAs are highly stable in plasma and urine, they are attractive biomarkers. AKI coincides with reduced expression levels of most, but not all, circulating miRs (37). In the plasma of patients with AKI, miR-16 and miR-320 were found to be down-regulated, whereas miR-210 was upregulated (38). This upregulation is a strong independent prognostic factor for 28-day survival of critically ill patients with AKI (38). Likewise, urinary levels of miR-21 and miR-155 could successfully distinguish patients with and without AKI (36). This is in keeping with other findings that urinary miR-21 appeared to be more associated with AKI prognosis than plasma miR-21 levels (39,40). Serum miR-21 levels were associated with the development of AKI when sampled before cardiac surgery (41) and 6 hours after cardiac surgery (42). In the latter study, urinary miR-21 levels were also associated with AKI (42). Interestingly, ischemic preconditioning could increase endogenous miR-21 expression and further protect kidney function (43). Urinary miR-200c and miR-423 were upregulated in AKI on the basis of microRNA array analyses (39). A panel of 10 miRs could be used for AKI diagnosis in patients in intensive care with nearly 100% sensitivity and specificity and four of them were associated with AKI severity (44). Another set of four miRs was associated with AKI development before S-creatinine rose after cardiac surgery (44). miR-192 was assessed for diagnosis of AKI when sampled 2 hours after cardiac surgery; however, it had a rather poor sensitivity and specificity (45). Likewise, urinary miR-30c-5p performed well as a biomarker of AKI after cardiac surgery, and even better compared with protein-based markers such as neutrophil gelatinase-associated lipocalin and kidney injury molecule-1 (46). In contrast-induced nephropathy, miR-30a, c, and e appeared to be significantly higher in comparison with patients who received contrast but without nephropathy (47). Although all three miRs correlated positively with serum creatinine, they only increased in 55.5% of patients with contrast-induced nephropathy. The positive predictive value of these three miRs varied between 91.3% and 94.9%, whereas the negative predictive value varied between 61.3% and 78.2% (47). Sun et al. (48) confirmed the increase of miR-30a and e and, in addition, they found miR-188 to be increased in a similar population. The value of microRNA as biomarkers of different graft-associated pathologies were investigated either by quantification of a set of miRs known to be dysregulated in the graft (21,25,33–35,49–51) or involved in pathways of interest (52), or by performing a global miR profiling on blood cells (30,53), serum/plasma (54,55), and urine (51,56). A significant upregulation of miR-146a was observed in urine samples of recipients transplanted with a deceased donor compared with a living donor, and was thus suggested as a diagnostic marker for ischemia/reperfusion injury (21). Both senescence associated miR-223 and miR-142–3p are upregulated in the graft and PBMC of patients with acute T cell–mediated rejection (25). Increased miR-223 levels, along with increased levels of miR-10a, were also observed in the serum of a small number of transplant recipients during T cell–mediated rejection (49). The upregulation of serum miR-99a and miR-100 was also reported in kidney transplant recipients with T cell–mediated rejection (55). However, previous miR profiling studies reported decreased levels of miR-99a expression in T cell–mediated rejection kidney allografts (24,27). Paired tissue and blood analysis should therefore be performed to determine the significance of these conflicting results. In multivariable logistic regression analysis, a panel of five miRs isolated from blood cells (miR-15b, miR-16, miR103a, miR106a, and miR-107) could accurately discriminate an acute vascular rejection (Banff II–III) from stable graft function. The difference between T cell–mediated vascular rejection and other phenotypes was less distinct (53). Urinary levels of miR-10a were significantly upregulated, whereas miR-10b and miR-210 were downregulated in urine samples of recipients with acute T cell–mediated rejection. Furthermore, expression levels of urinary miR-210, involved in cellular aging, were related to biopsy-proven rejection severity with levels normalizing after rejection treatment. However, receiver operating characteristic (ROC) analysis revealed a weak specificity and sensitivity for the distinction between acute rejection and stable graft function (56). A decreased expression of miR-210–3p was confirmed in urine pellets from transplant recipients with T cell–mediated rejection (50). In this study, higher expression levels of urine miR-155–5p, also reported as highly expressed in the graft during acute T cell–mediated rejection (19,24–26), were more discriminative for the diagnosis of acute rejection (50). In PBMC from recipients with chronic, but not acute, antibody-mediated rejection, miR-142–5p was upregulated. In ROC analysis, the discriminative capacity for chronic antibody-mediated rejection versus stable controls was fair (30). Although the authors suggest the specificity of this miR in chronic antibody-mediated rejection, other groups also reported increased levels of this hematopoietic miR in PBMC and grafts of recipients with an acute T cell–mediated rejection (24,25). Lower miR-211 and miR-204 expression levels and an upregulation of miR-142–3p were found in urine pellets of recipients with biopsy-proven IF/TA compared with recipients with a normal histology and graft function (34). miR levels in the urine appeared to be correlated with miR expression levels in the graft (34). These findings were confirmed in a cohort of recipients with established IF/TA (51). A significant downregulation of miR-200b, miR-375, and miR-193b, and upregulation of miR-423–5p and miR-345 has been observed in these two miR discovery data sets. A larger prospective validation study revealed a significant downregulation of miR-200b in urine of recipients with established IF/TA 1 year after kidney transplantation. No correlation was found between the expression of miR-200b and proteinuria (51). A significant downregulation of miR-200b was also reported in plasma of recipients with IF/TA (52). Higher expression levels of miR-21 were measured from recipients with biopsy-proven IF/TA, thereby showing a gradually increase with IF/TA severity. Furthermore, no correlations were found between miR-21 levels and the presence of other acute or chronic Banff lesions in this study (35). Insight in the pathophysiological role of miRs in CKD is growing, and miR targeting therapies are being introduced in the clinic. In contrast, the role of microRNAs as therapeutic targets in the pathophysiology of AKI and kidney transplantation is still in the exploratory phase and needs confirmation and validation. Few articles show that in AKI, microRNAs are strong regulators of the NFκB pathway as a major target in proinflammatory diseases. However, the NFκB pathway also plays a role in anti-inflammatory processes via its antiapoptotic functions. This dual effect has hampered the development of anti-NFκB pathway drugs. In the kidney transplantation field, more insights in the pathophysiology of transplant-related processes, as well as biomarkers for diagnosis, are awaited. Given their remarkable stability, several microRNAs have been put forward as biomarkers for the diagnosis of kidney diseases and transplant related pathologies. Rather poor performance in ROC analyses currently hampers the clinical implementation of microRNAs as diagnostic or prognostic markers. However, after kidney transplantation, a combined panel of five miRs was able to discriminate T cell–mediated vascular rejection form stable graft function (53). Thus, it is likely that the use of microRNA combinations (panels) will increase their clinical utility. Because most studies remain in the exploratory phase, there is a need for larger clinical prospective trials to validate the results and thoroughly investigate their diagnostic and prospective potential. A standardized method for sampling and analysis is recommended to improve between-group comparison in external validation set-ups. The following databases were used: PubMed and Web of Science. No limits were applied on publication date and the last database search was performed on May 25, 2018. The following MeSH terms were used: “microRNA or microRNA or miR AND AKI”; microRNA or microRNA or miR AND renal function”; “microRNA or microRNA or miR AND acute renal impairment”; and “MicroRNAs AND Kidney Transplantation.” Only articles on human research were withheld for this review. We thank Erik Snelders for his help with the figures. Drawings are on the basis of material from the Servier Medical Art image bank (https://smart.servier.com/, creative commons license https://creativecommons.org/licenses/by/3.0/). E.M.G. is supported by the Research Foundation Flanders (PhD fellowship 1136317N).